Wladimir Balentien flips on the television and takes in a rare moment of relaxation. Instead of his Tokyo Yakult Swallows uniform, which will be worn later, he’s clad simply in a red T-shirt commemorating his back-to-back home run titles and yellow shorts from a past NPB All-Star Series. Here in the relative peace of this small, air-conditioned room near the team’s clubhouse it’s quiet, and the space offers a brief respite from both the unrelenting heat of a Tokyo summer and the glare of an ever-brightening spotlight. The goal he refers to is the single-season home run record of 55, held by Sadaharu Oh, Tuffy Rhodes and Alex Cabrera and among Japanese baseball’s most hallowed marks. That wasn’t the goal when Balentien began the season two weeks late due to a groin injury — back then, he just hoped to be in the top three and at least in the vicinity of the Yokohama BayStars’ Tony Blanco in the home run race — but the year has taken a far different course than even he could’ve imagined. Fans and media began to take notice as Balentien hit home runs at a rapid pace to start his season, and the spotlight grew brighter once he left Blanco in his wake and could make out Oh, Rhodes, and Cabrera on the horizon. He hit his 52nd of the year Friday night, and attention is at a fevered pitch with 55 now just three homers away. Hitting three home runs is only half the battle. There’s also a mountain of pressure that must be overcome. Balentien was popular before, but he’s never dealt with this type of attention, and does his best to block out distractions and remain pointed in the right direction. Media requests roll in at a rapid pace, and Yakult’s PR department is taking steps to ensure Balentien isn’t stretched too thin. From the time he arrives at the ballpark until he goes home, Balentien operates in a fishbowl. Reporters trail him everywhere, peppering him with questions about the same thing in various ways, and at Jingu Stadium, fans mob him during the short walk from the stadium exit to the clubhouse. So far, Balentien hasn’t let it get to him. His loud, deep, bellowing laugh rings out just as often, and he’s as happy-go-lucky as usual. The only difference is how much more he cherishes the slivers of peace and quiet he gets. It’s understandable that the spotlight is trained on him. 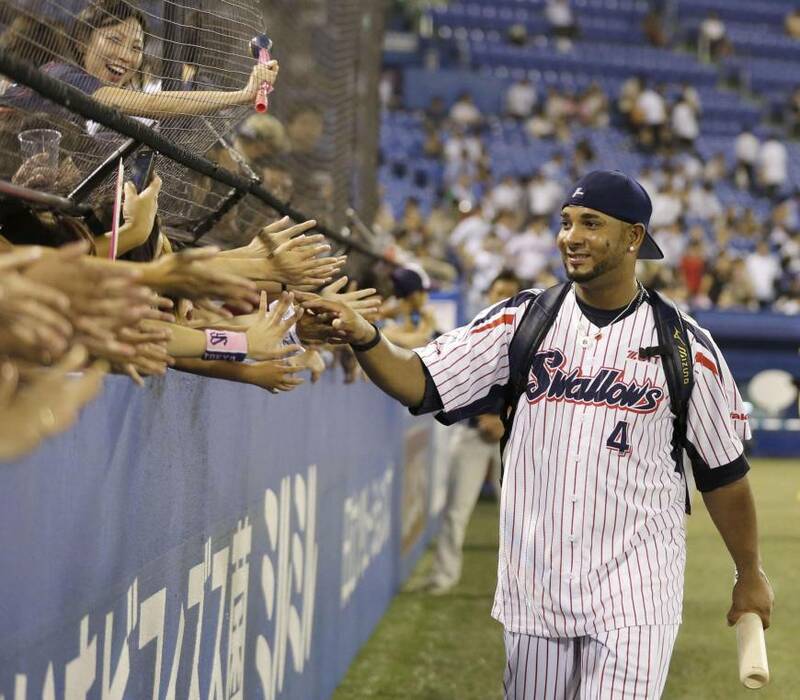 Balentien is having one of the most special individual seasons NPB has ever seen, while his team, ravaged by injuries, is suffering through a rough campaign. 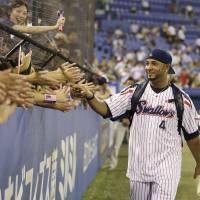 The Swallows are mired in last place in the Central League, meaning everyone’s sole focus has shifted to “Coco,” and he hasn’t disappointed. Balentien has 52 home runs with 29 games remaining. He hit Nos. 49 and 50 in Yakult’s 111th game to join Cabrera (117 games in 2002) as the only players with 50 homers before their teams’ 120th game. “It’s impressive,” Hanshin Tigers outfielder Matt Murton said recently. “How many players currently in this league will hit 40 home runs? There’s only a select group of guys who will do that. Balentien also leads the CL with a .342 average and his 110 RBIs are second only to Blanco’s 120. He’s worked to improve his discipline at the plate, and has become a nightmare for opposing teams. Despite the noise and distractions present, Balentien won’t let himself stray from the path. He finds moments of levity in the clubhouse with his teammates, who he says are pulling for him to break the record, but aren’t putting any pressure on him, and telephone conversations with his stepfather, Rudney Leonora, in his native Curacao. Balentien hopes to be able to look back one day and really let the events of the season — many of which have yet to be written — wash over him.